Thursday afternoon, things got a little more interesting here in North Mecklenburg in the race for the Republican nomination for NC House 98. Conservative activist Sharon Hudson of Huntersville filed for office today seeking the Republican nomination in the race to replace Thom Tillis in the Legislature - bringing the total to three candidates on the Republican side. Hudson is a founder of the new Lake Norman Conservatives activist group, and she has been active in Republican Party politics in the local area. Last year she was involved in many of the efforts opposing the HOT Lanes project for widening I77 including the efforts to get a resolution opposing HOT lanes passed at the MeckGOP convention and getting a plank added to the NCGOP party platform opposing the toll lanes. In the primary race Hudson faces John Bradford and Lynette Rinker of Cornelius. Both Rinker and Bradford served as elected officials during last year's raging debate on the HOT lanes project - casting crucial local votes in support of the effort. Even though anti-toll candidates generally came up short during the 2013 election cycle, a three way race where this is an issue once again could yield some excitement. A split "establishment" vote between Bradford and Rinker opens up the possibility that no candidate gets to 40% of the vote in the May primary. That would force a high-stakes, mid-summer, run-off in a low turn out second primary. If Ms. Hudson makes it into a run-off as the sole anti-toll candidate, it could be a real toss-up and anyone's guess how that will turn out. Wednesday night finally saw the vote on the proposed CHS sign change for the new mental health facility on highway 73 near Summers Walk. ﻿﻿ As reported here, this approval seemed to be a foregone conclusion after the Davidson Planning Board unanimously approved the change last month. While it does appear that CHS gamed the system to a degree in pursuing this zoning change and it likely sets an unwelcome precedent for signage on the East Side of town, the truly important thing for good government is what happened just before the vote. For the first in recent memory at a Davidson Town Board meeting, there was a detailed discussion about allowing a Commissioner to be excused from voting because of a conflict of interest. More importantly, a Commissioner was actually allowed to be excused from voting by his fellow Board members - removing the façade that somehow Davidson's Board is beyond reproach and that members' business dealings never collide with their responsibilities as elected officials. As we've been very strongly encouraging in these pages (here, here, and here), Commissioner Brian Jenest requested and was allowed to not vote on the CHS sign - a sign he designed. He did not disclose how much money his firm made on the project. He did not disclose any information about when the need for the zoning change was determined. He reversed the logic and said that he'd actually get more work if the zoning change was not approved - meaning if he was allowed to vote and he voted for it, he would somehow be voting against his own best interest, thus minimizing the issue to a degree. However, in the end Commissioners agreed that voting on a project where a Commissioner's firm is directly involved is in fact a conflict of interest. The Board did the right thing here. This was a small victory for good government. However, Commissioners and our Town Attorney should not continuously be looking for loopholes in how to vote on things where a Commissioner has a clear self-interest. Incidentally, Commissioner Fuller was allowed to vote on the sign after admitting that his employer, the McIntosh Law Firm, does significant business with CHS. However, that business is likely not related to building design, so he did not recuse himself as this vote did not directly impact his firm. That was also the right thing to do. Below is the video. The whole meeting is only 25 minutes. The discussion about recusals starts at the 6:45 mark. Tuesday night, the Davidson Town Board will again take up the issue of a rezoning request for the new CHS mental health facility on highway 73. It will pass, and there is really very little question about that. The Board had a hearing last month, and the issue was sent to the Planning Board where the request received unanimous approval according to an email from one of our Planning Board members. Readers may remember that we raised the issue of Commissioner Jenest voting on the rezoning request since his firm did the design work for the large, lighted roadside sign that is behind the requested zoning change. See here and here for that background. While it does not seem right to allow CHS to game the system with this rezoning request and the preferred solution is for the Town require CHS use the Board of Adjustment process for this variance, the larger issue of trust in government revolves around letting a Commissioner vote on an issue where his firm has directly worked on the issue in question. There is a conflict of interest here, and Commissioner Jenest should be allowed to recuse himself. Last month he told aShortChronicle that he would "absolutely" plan to offer his recusal on the issue. Let's hope nothing has changed on that front. If he does offer his recusal, then the Board should allow it. At the last work session, the Board heard from the Town Attorney, Rick Kline, on the State's ethics legislation around when Commissioners can be recused. The Board should be commended for taking a closer look at this. This is important. Very little negatively impacts how the public perceives government more than when people think the system is rigged for elected officials benefit. Board members can allow Commissioner Jenest to recuse himself. Let's hope they do so. The first round of campaign finance reports came in last week for the race to replace Thom Tillis in NC House District 98, and as usual when you follow the money some interesting things pop up. On Democratic Party side of the race, Davidson resident Natasha Marcus reports a very respectable sum of $47,379.03 in total receipts with $39,435.95 on hand. 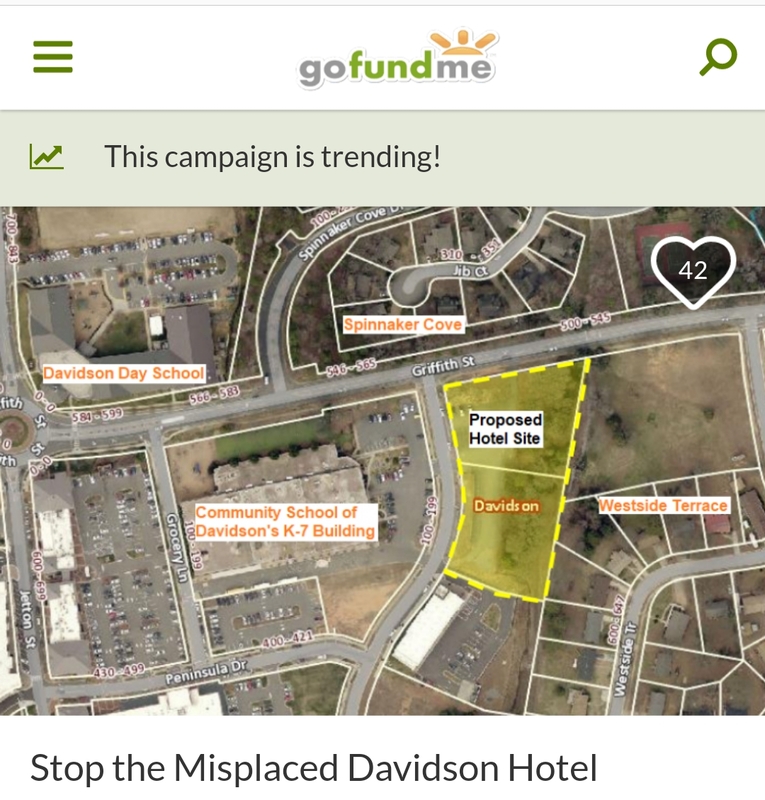 This comes from a donor base of over 140 including some Davidson politicos - Commissioner Rodney Graham, Former Commissioner Margo Williams, and Former Davidson Mayor Randall Kincaid. Notably, the total receipts includes only a $500 loan from the candidate, so if Ms. Marcus decides to put in any sizable amount of her own money she will certainly have enough to remain competitive financially. Most of Marcus's donations came from the local area or from what appear to be family members, but one donation stood out - a $2528 contribution from the campaign committee of former State Senator Eleanor Kinnaird (D-Chatham, Orange). A little research reveals that Sen Kinnaird has long been supported by Lillian's List - North Carolina's leading lobbying group opposing restrictions on abortion. The group is modeled off of Emily's List, the national group that is Kay Hagan's largest supporter. Here's how the organization describes itself on its website. "Lillian’s List of NC is a statewide community of individuals who work to recruit, train, promote and support pro-choice progressive women running for public office in North Carolina. We are modeled after EMILY’s List and provide financial, strategic, and political support to women serving in the state legislature and the Council of State. We also strategically recruit new candidates committed to reproductive freedom and equality for women." The site also states that during the last election cycle Lillian's List and its supporters funneled over $250,000 to its favored list of candidates. When Senator Kinnaird liquidated her campaign fund after resigning her office last year, the last two donations went to two other candidate campaign committees, those for Natasha Marcus in NC98 and Kim Hanchette NC49 - the two candidates currently highlighted on Lillian's List. It remains to be seen if abortion will be a major issue in the NC98 race, but this donation combined with others from Lillian's List fundraisers and member donors likely will make this interest group the largest combined donor group to the Marcus campaign. On the Republican side, the big story is the huge campaign war chest Cornelius Commissioner John Bradford has amassed - $154,000. Yes, you read that right! What makes this interesting is that it comes almost entirely in the form of a personal loan from Bradford to his campaign. Certainly, the campaign will be bringing in quite a few donations, but at this point it's almost all Bradford's own money. Self-funding of campaigns is not uncommon. For example, when Thom Tillis ran for this same seat in 2006, he loaned his campaign a total of just over $100,000 out of total fundraising of around $150,000. What makes the Bradford loan different is that he's loaning the money all at one time. Tillis loaned the money in eight different installments over the course of the campaign. And that's where things get even more interesting. It appears Bradford may have been originally planning on taking that same approach of loaning money in chunks, but changed his mind. According to the filing documents, Bradford loaned his campaign $10,000 on Christmas Eve. However, the documents also show that the loan was repaid the same day. Then, on December 26th, Bradford made the much larger $150,000 loan. The information about the original $10,000 loan did not show up in the campaign finance reports until the report filed this past Monday, February 4th. In the original paperwork filed by the campaign back in December, it looked like a single loan had been made when in fact there had been two. So, why the change of mind? Two possible explanations come to mind. 1. $10,000 doesn't scare anybody in politics. On the other hand, $150,000 sends a message. For example, Bradford's only announced Republican opponent, former Cornelius Mayor Lynette Rinker, has only $3000 on hand according to her campaign finance reports for the same period. Who knows? Bradford's war chest, might scare her off from even filing if it's clear she can't compete financially. 2. Bradford likely has strong expectations of future fundraising, and maybe he expects to be able to pay himself back quickly during the campaign. He has already lined up an impressive list of endorsements from elected officials, and he appears to be running an extensive campaign. It's possible that he has been well assured of getting back some of his money sooner rather than later. Again by comparison, it took Thom Tillis's campaign until 2013 to pay back just $50,000 of the loans he made his campaign. Big-money is a big part of big-time politics. Where that money comes from and how much is spent frequently drives campaign issues and the outcomes. In this very Republican leaning district according to the latest Civitas Partisan Index, how this plays out will be something to watch. Over the years, encouraging greater transparency at Town Hall has been a regular topic for this blog and that's often come along with criticism of how certain things are done. So, when things start to move in the right direction, there's an obligation to recognize those improvements as well. In early January, several suggestions were made in this post - Transparency Opportunities for New Davidson Board. It now appears implementing at least a couple of these suggestions may be in the works. The so called "team building" meetings occurring in Commissioners' homes on the 3rd Tuesday of the month have not been added to the Board's calendar, and the current understanding is that they won't be. Since their inception, these meetings have raised transparency issues for many of those who watch town government closely. See "Special Meeting" Confusion Abounds Monday Morning for more background on these meetings. Meeting in private homes is allowed by law and the Town followed all public notice procedures. However, the practice of meeting in private homes is really intended for very small towns that don't have a town hall - not a town like Davidson. The second improvement in town meeting schedules is that Board members will no longer be meeting in twos with town staff to effectively avoid the state open meetings laws. Last year when the town implemented its 1st Monday meeting on the monthly calendar, we thought that meant an official end of the regular, closed, one-off meetings with staff. However, that apparently was not the case. On January 28, the town sent out notice about a new "pre-meeting" that will occur prior to each regularly scheduled Board meeting. These will regularly occur at 4pm prior to the Board meetings. Again, it is our understanding that these new open pre-meetings will in fact replace the private staff briefings. From the town's notice..."Going forward, the board of commissioners will hold pre-meetings before every regularly-scheduled board meeting and work session, typically held on the 2nd and 4th Tuesdays of the month at 6:00 p.m."
Finally, there may also be a rescheduling in the works to move some content from the regularly scheduled Board Meetings and Work Sessions to streamline the agendas and free up staff from having to attend many of these meetings. Eliminating the team building meetings helps allow for this by opening up that time for staff updates or other items. That should also allow for the regular meetings to be a bit shorter making them more user friendly to Board members, staff, and citizens alike. While these changes may seem minor to some, they do in fact improve the perception of transparency. Having board members willing to push for that type of improvement is good for public trust in government and good for our town.